Have issues with unlocking a memory card in order to be able to read it? Trying to write a file on your USB flash drive or SD card but get “The SD Card is write protected” message? I am going to list all possible methods of removing write protection and formatting your memory device (Sandisk, Samsung, etc.) for it to work in a regular operating mode. Q: Why do I get a "The disk is write-protected" message when I transfer files to my SD card? If the lock switch is loose and moves easily It is likely the switch is sliding to the locked position as the card is placed in your host device. In this case the card will need to be replaced. Please contact SanDisk support to check warranty status. For some memory cards there is branded software which we’d recommend using since it works better and more effectively than Windows formatting tools. Such apps listed below will help you remove write protection in a number of cases. A disadvantage of this approach is losing the files you currently have on your memory card. How to format a memory card which is write protected? You can use SDFormatter. It fixes file reading and writing errors and remove write protection from sd card. Quick or full format unblocks a memory card. Using the latest version of SDFormatter, go for the Overwrite format option. A more universal method is making use of utilities like HP Disk Format Tool. In the settings you can select file system and format type as well as force format your SD Card. HDD LLF contains the same set of options as the two previously described tools. It deals not only with HDD/SSD but also with SD, MMC, MemoryStick and CompactFlash memory devices. This way of disabling write protection is simple but if Registry is mishandled, your operating system will be disrupted. So we’d recommend making a backup copy of your Windows Registry before you take action following these steps. 1. 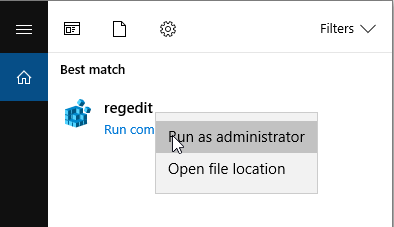 Open Registry editor as an administrator (Start – regedit). 2.2. In the menu select New – Key; name it StorageDevicePolicies. 3. 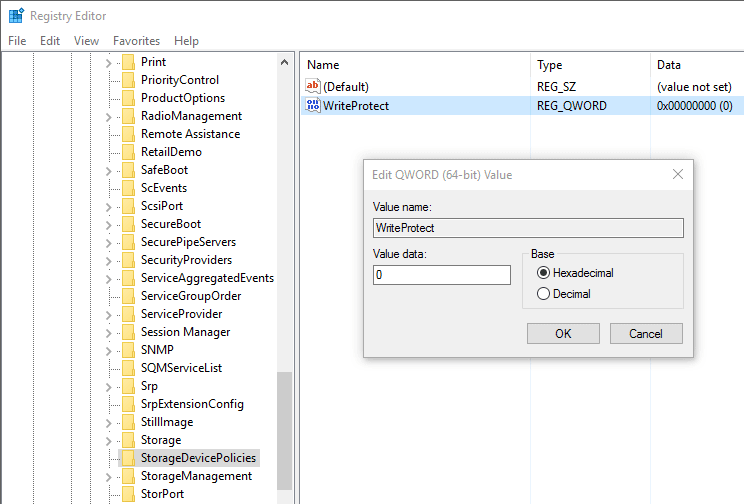 Right-click on the StorageDevicePolicies and select a new value of the parameter DWORD(32-bit) for a 32-bit OS or QWORD(64-bit) for a 64-bit one respectively. 4. Rename DWORD/QWORD to WriteProtect and double-click the line changing value to 0 (HEX). 5. Safely remove the memory card and reboot your computer. Diskpart is a console utility in Windows 2000-XP and higher which enables you to manage disk partitions and volumes at a low level of access. Open the command prompt (cmd.exe). Type "diskpart" to start the utility. Type "list disk" to show the list of available disks in the system. Find your USB flash drive on the list; type "SELECT DISK n" where n stands for your memory card with the write protected partition. Type "clean" (you may have to repeat it two or three times). Type "create partition primary" to create a new partition on the memory card. Type "select partition" to select the partition on the disk. Type "active" to activate the disk. Type "format fs=ntfs" to format to NTFS (make sure you selected the right memory device!). This method of disabling write protection is suitable both for SD Cards and USB sticks. We are going to use an alternative utility diskmgmt.msc. Start – Run – gpedit.msc. Go to Computer Configuration – Administrative Template – System – Removable Storage Access. Disable parameter "Removable disks: Deny All Access". Scan your SD Card for viruses. Malware applications set up their own control over your files and won’t let you overwrite them. Use any effective online antivirus. If your SD Card has a write protect switch, toggle it to enable access. Upgrade your SD Card firmware. The exact model can be found in Google by chip vendor and chip vendor model, the data available in the Device Manager. My 32GB memory card is write protected. When I try deleting a file on it, I am asked to disable write protection or use another disk. What shall I do, how to disable write protection? I can neither delete files from my memory card nor copy any to it. No matter how many times I try to format my SD Card, it keeps asking me to remove write protection. I actually did remove it several times but every time it is back. My phone gives information on the card being broken. My computer and laptop accept it but I still can’t format it. I can’t format a memory card SONY 64GB, copy files to it or delete them. The system claims the disk to be write protected. I tried everything you described. Nothing helps. I bought this memory card about 3 months ago and it used to work without fail. I have tried all methods to format my sd card. If i remember well i installed 'hide files' app on my phone and was later at a stage compelled to reset my phone. I can see my files on the sd, i can also copy them. So since then i cannot delete or move my files on the sd card. Whenever i format my card everything seems to work out, and finishes to format. but when i go back to check files on sd the y are there, raw as they where. I don't know what to do and how to format write protected sd card. My Sandisk SD card doesn't want to delete or move things in. It says i must get access from memory card but when i try to press 'select sd card', it shows weird numbers. What must i do. I am having Samsung EVO+ SD Micro Card since 2016. Last week it stopped working, was not detected by my Moto mobile (Not detected by other mobiles). But it was detected by Laptop. I am trying to format it but it shows message 'Cant format write Protected sd card'. I almost tried every option to format it. Is there any method by which my mobile can detect it? Answer. You can remove write protection from the memory card via Registry, as well as using diskpart and diskmgmt.msc utilities (in Windows). As an option, format your SD Card to FAT32 using the tools mentioned at the top of this guide. I have Samsung S3600 which can’t write files to the memory card anymore. The funny thing is that there is a couple of files left on the card: two photos and a video, and there’s no way I can delete them. I did delete them from my computer but somehow they are back on the memory card. I can’t transfer any files to this memory card either. I never dropped my phone on the ground or into the water, the card just stopped working all of a sudden. How to disable write protection? I bought a microSD SanDisk 128GB for my Samsung Galaxy A5 (2016). When I insert it into my phone, it works for a short while and then prevents any files from being written on it. I’ve tried loads of things: formatted it on my PC and phone, but no use, it only helps for some period of time and then access is restricted again. Why is my sd card write protected? Answer. The file system on your memory card can be damaged, so you can’t write any new data onto it. In such cases we recommend scanning disk for errors using a basic tool chkdsk. Should it fail to help, format your SD Card using SD Formatter. I’ve no idea what happened to my memory card: when I connect it to my computer, it says that I must format the Drive J before using it. When I try formatting it, I get a message that disk is write protected. It prevents me from removing volume by the right-click using diskmgmt.msc, other operations can’t be performed either. The SD Card file system is Raw, and the system writes that it works. I wonder what to do, how to remove write protection and restore my memory card? If the disk prevents any files from being written to it, try opening your SD card in a different operating system. Besides Disk Management, you can use any disk manager such as Partition Magic or Acronis Disk Director. 1) Sandisk Ultra USB 3.0 16GB. I’ve done everything, from changing the letter to clearing the Registry. As soon as I start formatting, a message pops out that Windows can’t do it, and the USB can’t be found. I also tried HDD Low Level Format Tool v4.40 Final – same thing. How to perform formatting of a write protected USB stick? 2) I can’t format my microSD. It writes: Windows was unable to complete the format. I used a bunch of tools and the command prompt but can’t even delete files. I click “delete”, take out microSD and insert it back. The file that has just been deleted is there again. Neither deletion nor format works. Answer. Use other format tools: SDFormatter or soft provided by the developer on their web page (sometimes using them you can format a USB stick or microSD bypassing system errors). The problem can be also in Windows or configuration of the computer. Format your memory card on another computer or in a different OS (Windows/Mac OS/Linux). 1 Response to "How to Remove Write Protection from Micro SD / Memory Card"
I would suggest you to go through the link to know about how to fix SD card issues.